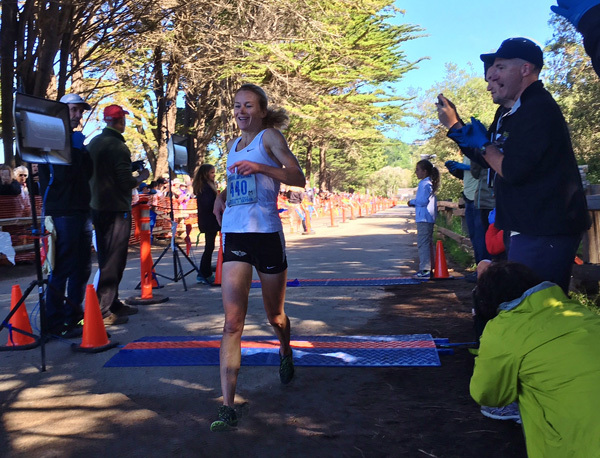 Three-time “bridesmaid” Chris Lundy of Sausalito, a 46-year-old San Francisco veterinarian, stepped up on Sunday and claimed her first Dipsea, holding off seven-time fastest time winner Alex Varner of San Rafael to win the 107th Dipsea race. Lundy, whose last near-miss was in 2013 when she placed second in the annual 7.5 mile trail race from Mill Valley to Stinson Beach, topped a starting field of 1,500 runners from 32 states including 70-year-old Amby Burfoot, the 1968 champion of the Boston Marathon from Mystic, Conn. The “Flying Vet” has won the women’s fastest time trophy a record six times in the Dipsea, but has been dogged by injuries in recent years. Last year she had hamstring surgery. Lundy, with a 12-minute head start, held off the hard-charging Varner, who scored a Dipsea career-best second-place finish. At 31 and running for the first time in the Dipsea with a head start (one minute), Varner posted the fastest time of 50:29, the seventh time he has won the Fastest Time Award. The Dipsea record is eight by Mike McManus. Two-time Dipsea champion Jamie Rivers of Mill Valley, a 66-year-old retired nurse, was third. She had compiled a sizeable three-minute lead by the time she reached Cardiac, the highest point on the course at 1,360 feet. Lundy finally caught and passed Rivers at the end of “Door No. 1,” one of the strategic short cuts along the route. Lundy was in the clear, and she didn’t need to worry about two-time defending champion and three-time Dipsea winner Brian Pilcher. He did not compete on Sunday because of a foot injury. “It opened the door. It helped me mentally not to have to run after him,” Lundy said. Yet Lundy, leading up to the race fresh and in fine shape, did not allow herself to envision the possibility of winning her first Dipsea. She didn’t want to be caught holding the bride’s bouquet again. Pre-race favorite Matias Saari of Anchorage, Alaska -- who finished second behind Pilcher in each of the previous two years -- placed fourth in his bid to become the first non-California to win the Dipsea since Coloradoan Gail LaDage Scott in 1986 and first male non-California resident to win the race since Australian Joe Patterson in 1975. However, Saari and Pelican Inn Track Club teammates Varner, Rivers, Galen Burrell of Berkeley, and Gus Gibbs of Ketchum, ID went home with the Team/Club Trophy. Rivers also won the Alan Beardall Family Trophy for the second year in a row with her husband. Roy Rivers, the 2008 Dipsea champion, placed 10th on Sunday. Fiona Cundy of Oakland, who placed 11th overall, clocked the fastest time by a woman for the second consecutive year. The winner of the Fastest Male and Female High School Runners awards were 14-year-old Lyle Rumon of Marin Catholic High School – one of six first-time Dipsea Black Shirt winners – and 17-year-old Quinn Lehmkuhl of North Tahoe High School. Seventy-seven year-old Hans Schmid of Greenbrae, who became the oldest Dipsea winner in 2012, claimed the final Dipsea Black Shirt, beating out 13-year-old Vanessa Miller of San Francisco for 35th place. Sixty-year-old Joannie Siegler of Davis was the first finisher from the Dipsea Runners Section. Longtime Dipsea volunteer and former starting line announcer Bob Cullinan of San Rafael won the Red Tail Hawk Award for “Leadership, Dedication and Sportsmanship,” Christie Patterson Pastalka of Belvedere, who made her Dipsea debut 35 years ago and won the race in 1987, was named the recipient of the Jack Kirk “Dipsea Demon” Award for “dedication, perseverance and performance over time,” and the Norman Bright Award for “Extraordinary Effort in the Dipsea Race” was given to 66-year-old Don Makela of Novato, who owns the third and fourth fastest times of all-time in the Dipsea and three years recovered from triple heart bypass surgery to return to compete in the race.